This tutorial is largely meant for beginners who want to learn to stack and process planetary images in Registax. Most tutorials don't give enough simple specifics for beginners. To that end, this one will be simple and straightforward, with just the basic essentials, which are all I use anyway. It will tell you exactly what you need to do to get good images. For non-astrophotographers, it may still provide an interesting insight into how the process works and just how much the processing matters. Load your captured movie or series of images into Registax. 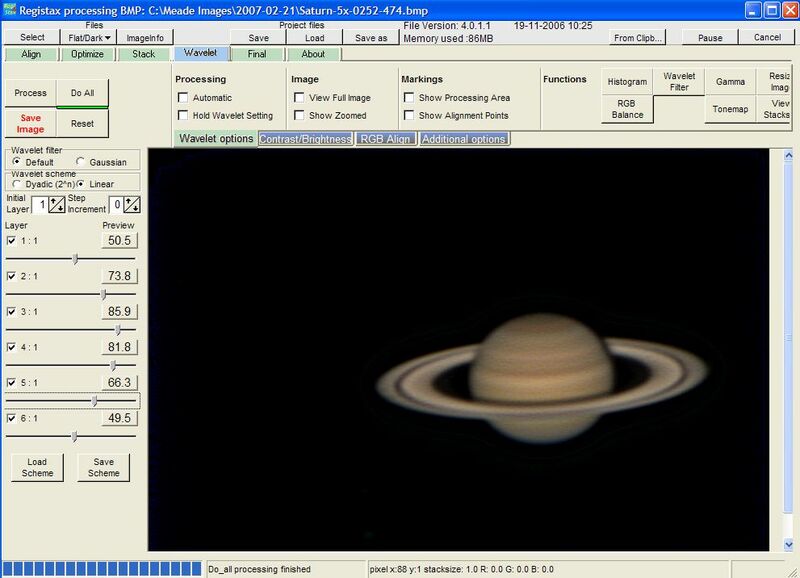 I primarily use a Meade DSI Color, so I use a series of .bmp images. Either through a Windows or Registax bug, I can only open about 250 at a time using the "open" ("select" in Registax) dialog box, but you can just drag and drop the files from Windows Explorer. 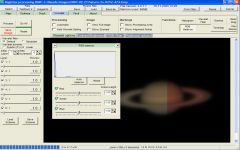 Select an alignment box that is a little larger than the planet, click the center of the planet, and then click "Align". 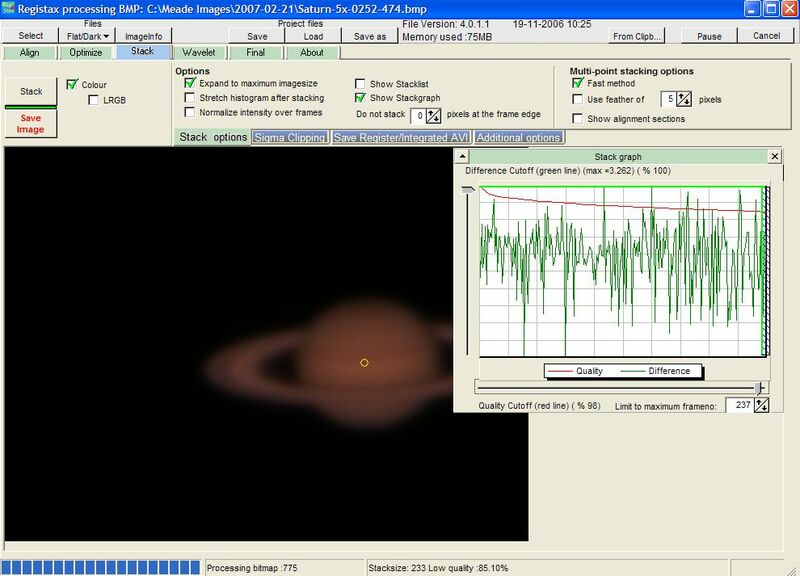 Registax will do the initial alignment and rank the pictures by quality and alignment error (the graph to the right). Amazing, how mediocre the unprocessed frames are, isn't it? The slider near the bottom of the window determines how many frames are kept. For this tutorial I'll keep a couple hundred. Up to about 2/3 of these might be usable, though. It depends on how many you have and how bad they are, but obviously, when the quality curve starts to drop off a lot, they need to be rejected. Click the "Limit" button. 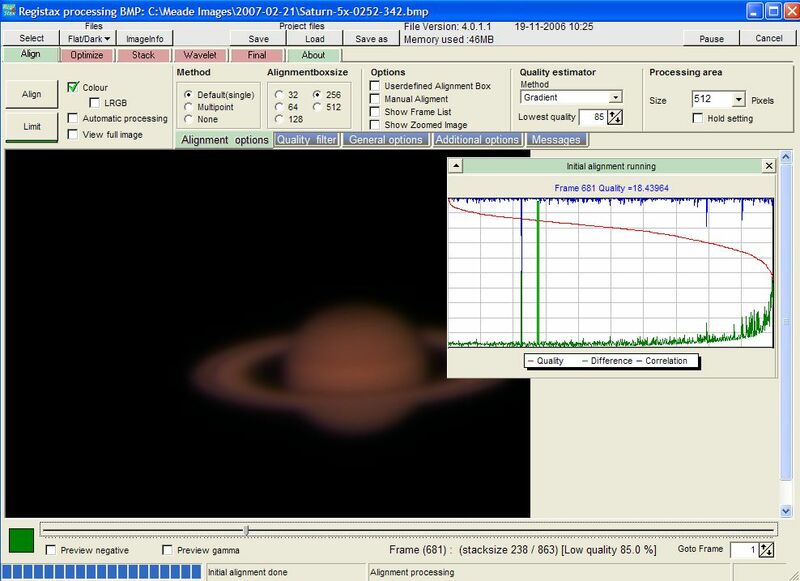 Registax will cut unused frames and move to the Optomization section. Click "Optomize". Registax will correct alignment errors as best it can. Click the "Stack" tab to move to the stacking section. For expedience, you can just click the "Optomize and Stack" button, which will skip you to step 4. That works fine when you can see from the initial alignment that you won't have any major alignment errors and won't need to reject any more low quality images. Click "show stackgraph". If you want, you can cut off a few more frames using the sliders for quality and registration difference. Sometimes there are anomalous spikes (there is one in the initial alignment in step 1) and if they aren't corrected, those frames will need to be cut out because they won't align and stack correctly. For this example, the graph looks pretty good and no further adjustment is necessary. Here I've also clicked the "expand image" option. This uses the entire width of every frame added together. If there is a lot of movement, that may mean you only have a few frames covering part of the image and that can degrade quality. Here, only part of the right side is cut off in some frames and it isn't noticeable when they are stacked. This I just figured out. 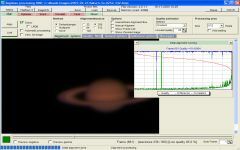 With the DSI-C, blue and green sensitivity is weak so I boost them both by 1.5x, the maximum Registax allows. It gives a more natural color balance than in many of my earlier pictures. My first came out too red, while later ones I balanced in Photoshop and they just didn't look natural. 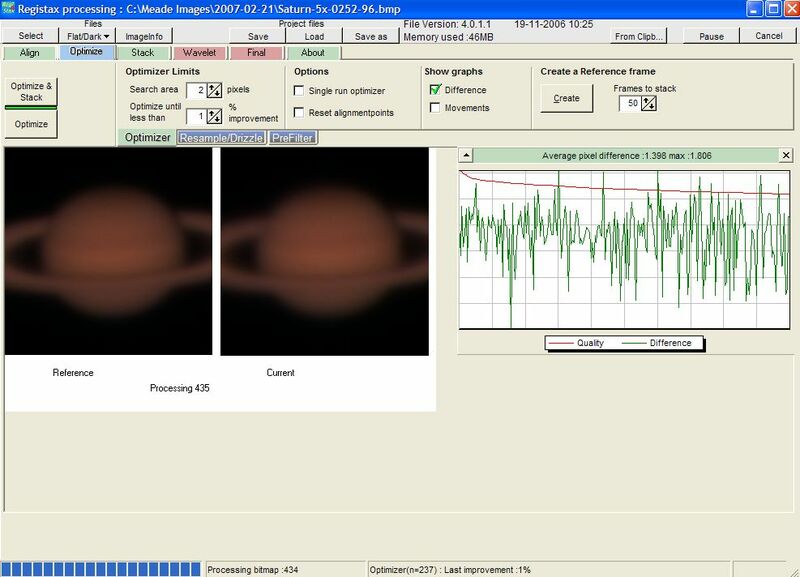 Registax only processes part of the image at once, which is fine because it provides a "before and after" view. 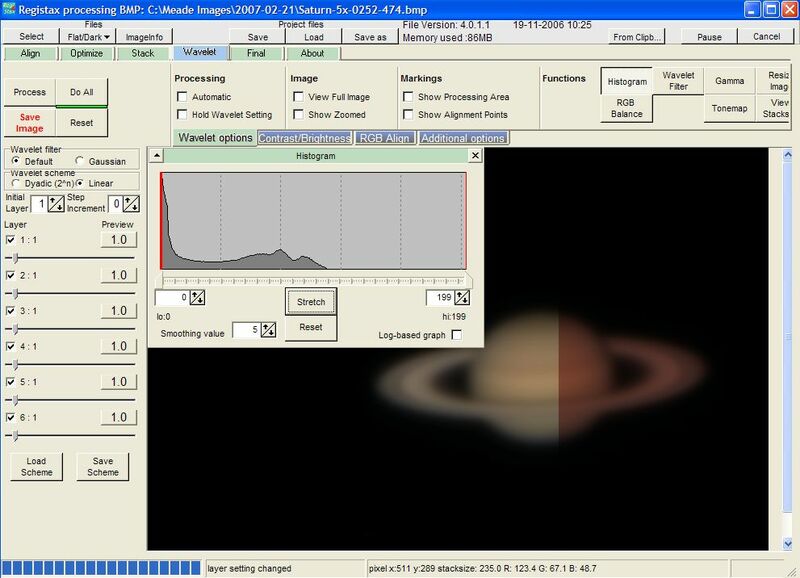 This image is slightly dim, so by stretching the histogram (moving the right-hand slider to the left and clicking "stretch"), the image is brightened. The histogram lists the brightness of each pixel. The large spike at the left is for the black portions of the image. If the spike isn't all the way to the left, the image will look grey, so move the left-hand slider to the right to blacken the background. 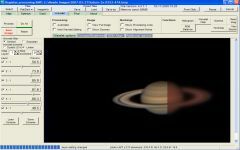 The wider, flatter hump just left of center represents the pixels in Saturn. I don't fully understand what wavelet processing is, but it appears to be a local contrast enhancement algorithm. It detects and amplifies small differences in contrast and it is amazingly effective. The top slider is coarser detail and the bottom one finer detail. Usually my wavelets look like a bell curve, with the top slider being most sensitive to overprocesing (it'll look grainy or pixelated if it is overdone). The more images you stack, the more you can amplify the detail. Use trial-and-error to find what looks best. Click "Do All", then save the image. That's it! There reallly isn't much to it. 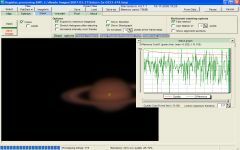 It only takes about a minute or two of input, though if you are stacking a thousand subframes, the initial alignment, optomization, and stacking steps can take several minutes for the computer to process. 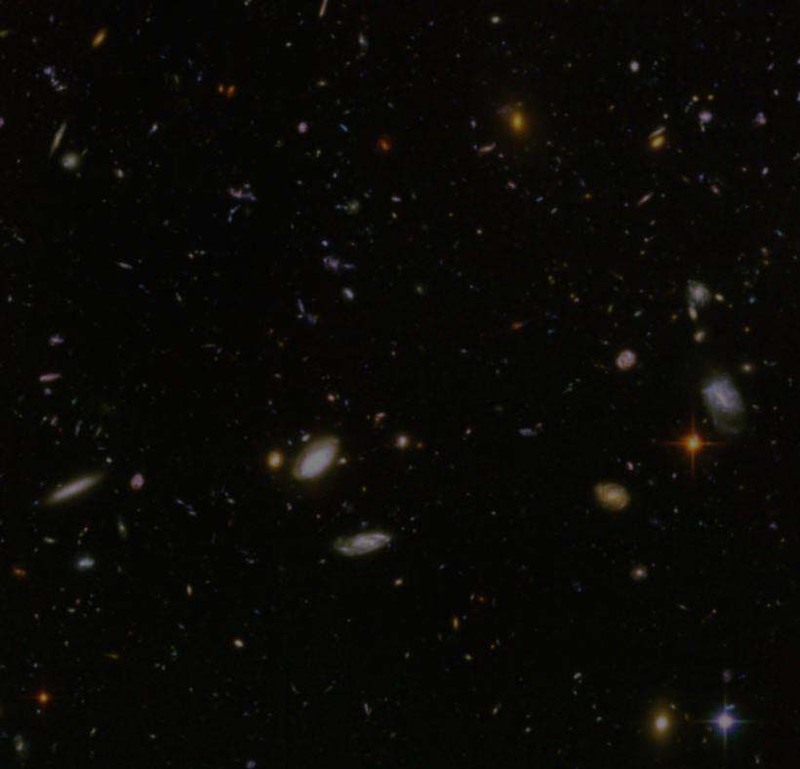 With larger images, the time is multiplied.